Use paid Facebook posts to drive fans to your audiobook detail pages on Audible.com. 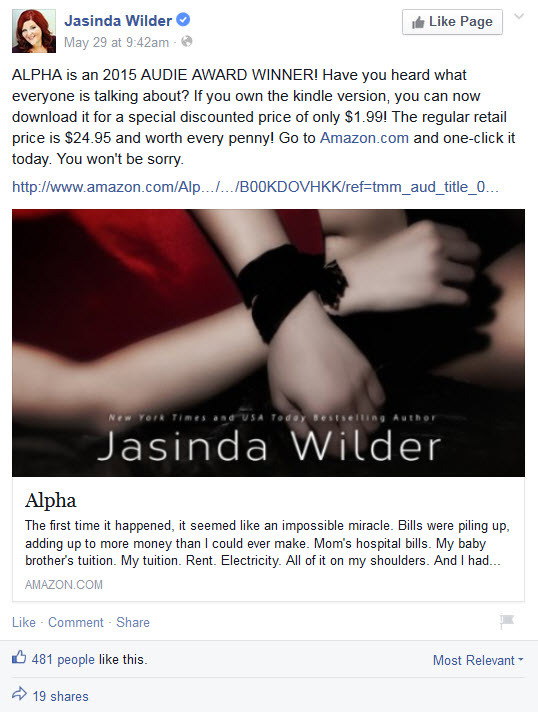 Soon after learning she’d won an Audie award for her ACX production of Alpha, Jasinda Wilder created a promoted post mentioning the win so she could capitalize on the buzz. More info on using Facebook to promote your audiobook can be found here. Hold onto your audiobook rights when negotiating traditional book deals. Author Ryan Winfield shared the importance of this decision with us last summer, and pushed to keep the audio rights to his upcoming Falling for June, set to release on June 30, 2015. Separating rights allows authors to leverage the promotional might of a publisher for print/eBook while being able to negotiate better royalty rates for the audiobook. New to audiobooks? Your best resource is… other authors. Sandra Edwards and Regina Duke have turned their friendship into a mentorship; Sandra was the first to take the plunge into audiobooks and makes herself available to Regina for questions and best practices. Find creative ways to expose your audiobooks to new listeners. We spoke to authors who send ACX promo codes to audiobook blogs and give them out to fans via their newsletter or Facebook page in return for unbiased reviews. Authors are also leveraging each other’s popularity by writing posts for each other’s blogs and even co-writing books and anthologies. Use GoodReads to make sure readers are aware of your audiobook. The GoodReads Audiobooks page is ideal for finding audiobook reviewers to whom you can give promo codes. Have you noticed GoodReads started rolling out audiobook samples on title pages? 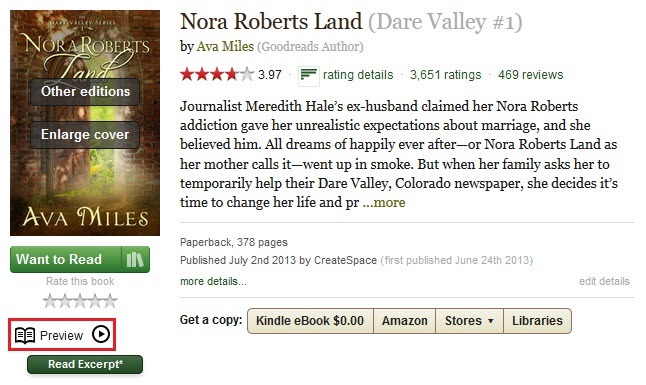 ACX author Ava Miles’s title Nora Roberts Land is a good example of this new feature (highlighted in red below), and once samples are available for all titles with audiobooks, every author will be able to use their title page to promote the audio version. Run a BookBub ad for your Whisperysync-enabled eBook. Exposing your eBook to a wider audience can have a trickle-down effect when readers find out they can get a great price on your audio version, as well. While we learned a lot from the authors and publishers we met this May, we know there are even more of you out there working hard to promote your ACX audiobooks. Share your audiobook publishing and marketing tips below and help your fellow rights holders learn from your experience.